On Tuesday, October 18, the U.S. 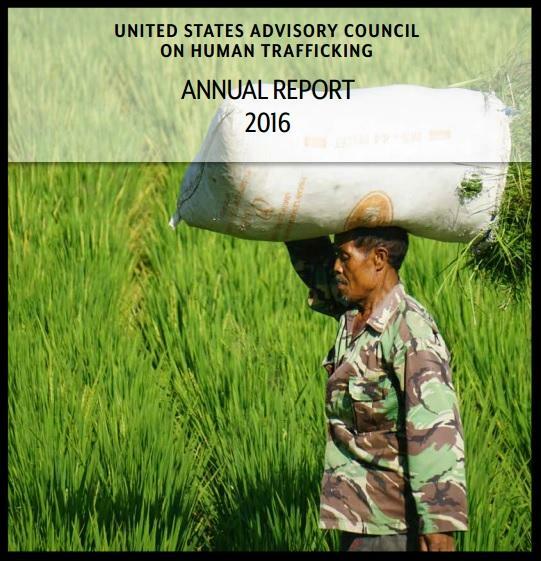 Advisory Council on Human Trafficking released its annual report on human trafficking. Each member of the Advisory Council is a survivor of human trafficking, and together they represent a diverse range of backgrounds and experiences. The Council, established by the Justice for Victims of Trafficking Act (JVTA), provides a formal platform for trafficking survivors to advise and make recommendations on federal anti-trafficking policies to President Obama'a Interagency Task Force to Monitor and Combat Trafficking in Persons.